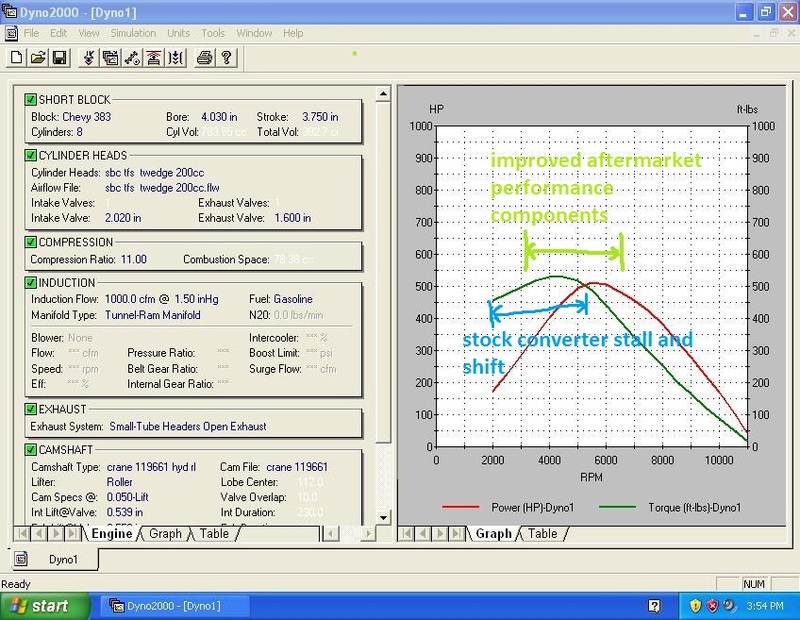 Discussion in 'transmission and Drive train' started by grumpyvette, May 21, 2009.
the required converter stall speed, has little to do with the type of lifter your using, displacement, compression ratio, port flow, cam timing and duration, are more critical, here. 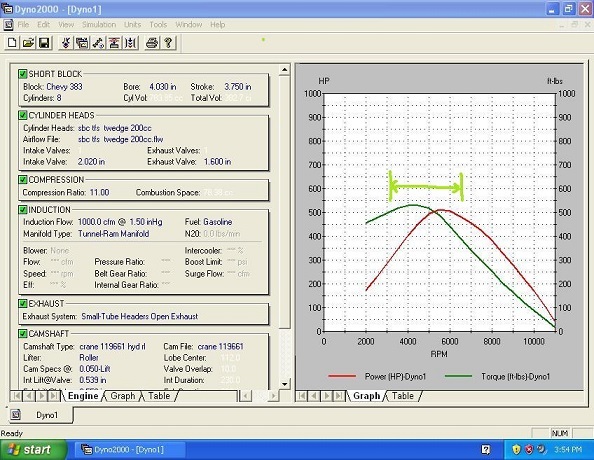 the stall speed you need, too be used, or changed is determined by the rpm range of the cam you select and your car weight, the cars automatic transmission first gear ratio, tire diameter and rear gear ratio, and most of all, the engines torque curve, that torque converter does not know if you have it installed behind a mild 307 SBC or a performance 502 BBC, the effective stall will depend a great deal on the available torque the engine produces, and yes the mild 307 SBC will stall out at a lower rpm than a performance 502 BBC,with the same torque converter. one very good reason to talk with the torque converter manufacturers tech dept before selecting a converter and NOT just looking at the rated stall speeds listed in a catalog. a mild roller cam would work with a stock stall converter just as a mild flat tappet lifter cam will. the whole idea of swapping to a higher stall speed torque converter is to allow the engine UNDER LOAD to jump in rpm up into the engines most efficient power range or the most effective part of the torque curve. the basic object of swapping to a higher stall converter speed is to allow the engine to spend a good deal more time in its most efficient power range without needing to WASTE TIME build rpms slowly up in the lower engine speed ranges where there's a good deal less usable power available, I'm always rather amused that so many guys want to get so darn confused about what is basically brutally simple, the purpose of a performance torque converter is to allow near instant access too and full use off and efficient use of the engines peak torque over most of its power band, the transmission must of course be set up to shift to the next lower gear each time the engine rpms start to exceed the ideal power range or drop back into the ideal power band if the torque available is no longer sufficient to easily move the car, to do this you simply need to know the cars drive train gearing tire size and the engines power band and red-line or upper rpm limitations, and the engines lower rpm power band effective limitations and a dyno tuning test session easily determines those factors. of COURSE a high stall converter SLIPS a bit more than a stock converter,THATS THE WHOLE POINT OF THE DESIGN! it allows the engine rpms to nearly instantly reach the most efficient power band and almost as instantly drag the transmission gearing up into that rpm range along with it without bogging the engine or forcing it to spend wasted time at the lower rpms where the engine fights to make decent power, when you apply throttle that's,the whole IDEA! 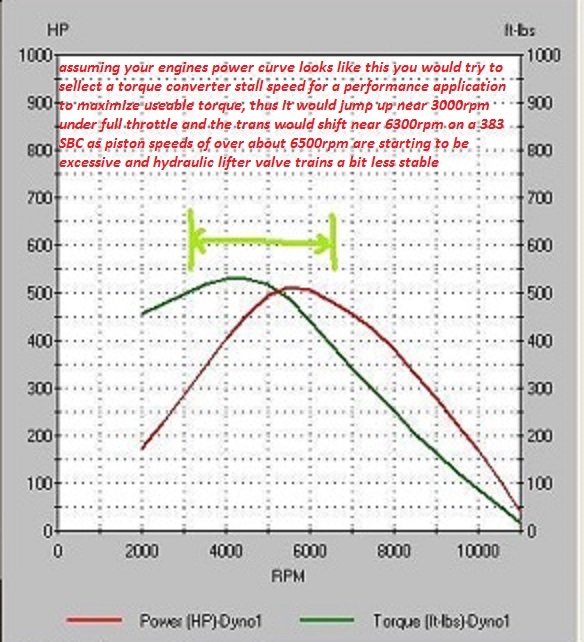 it allows the engine to rapidly increase rpms while seamlessly, transferring the engines torque to the drive train, the more force or torque you apply the higher the rpm level the converter will stall, this is why the same converter on two engines may not stall at the same rpm, but you'll find your applying the power to the rear wheels without you needing to have the engine waste time in its far less effective lower rpm power band, but you'll rarely notice that slippage, during any performance style driving, simply because the engine and transmission will rather rapidly regain similar speeds, its not like theres a noticeable time lag, between the throttle being depressed and the cars acceleration, thats nearly instant, both at part or full throttle, the difference is only in how far the engine rpms vary for an instant as the cars rear wheel speed trys to very rapidly catch up with engine rpms. The concepts similar to a smaller engine ,manual transmission drag car letting the clutch slip for an instant as it launches so the engine rpms stays up over lets say 3500rpm,then rapidly accelerates to 6000rpm plus to prevent the car from bogging, rather than letting traction stall the engine! IF your thinking of swapping to a higher stall converter,you should be able to answer the questions, listed below as it will be to your advantage to do so, by simply asking yourself ...those questions, but be aware your transmission gear ratios and rear gear ratio effect the correct choice in converter stall speed.one of the most common myths about high stall torque converters , is that the car won,t move under part throttle until near the rated stall speed is reached by the engine, think about that a second, then think about how your current car reacts to part throttle and realize your stock converters stall speed is probably 600-700rpm higher that the rpm that effectively moves your car at part throttle. the first thing youll want to do is test your current converters stall speed and find out what your currently dealing with, so you have a few facts and a start point! if YOUR NOT SURE DO YOURSELF A FAVOR AND CALL AT LEAST 5 DIFFERENT HIGH PERFORMANCE CONVERTER MANUFACTURERS AND ASK FOR RECOMMENDATIONS BASED ON YOUR COMBO, that way your bound to at least pick up some basic info and ideas. (1) was the current converter stall speed performing well? (2) what if anythings changed that makes you suspect a higher stall will improve things? (3) whats your current engine power curve? (4) whats your rear gear ratio?, whats your tire diameter? youll spend much less time in each transmission gear range with a 4.11:1 rear gear than a 2.87:1 rear gear so thats an important factor? (5)are you planing mod mods that make you suspect you'll require a higher stall speed, are you planing on installing larger diameter tires? a longer duration cam? (6) do you have an auxiliary transmission cooler installed and whats your normal trans fluid temp range? (7) have you called at LEAST 4 different converter manufacturers and ask for their input? suggestions? The formula for STR is EXACT OUTPUT TORQUE ÷ EXACT INPUT TORQUE = STR. while a manual transmission like a muncie has traditionally been used in performance muscle cars , the current technology with a higher than stock stall speed converter and a decently strong auto transmission like a properly built TH400 or $l80E makes the rather common 450-500 hp 383 small block a much more reasonable combo, with decent durability. Ive built dozens of 383-406 SBC engines and properly configured and assembled 383-406 SBC engines are fully able to shred a stock 700r4/700r style auto transmission, over time as both transmissions were designed to operate with engines providing no more than 400 ft lbs of torque. This requires a known power source and a data recovery system. STR is just what the name implies. The ratio of torque multiplication at stall. As soon as the turbine rotates (car moves) the ratio starts dropping rapidly until enough RPM has been reached for the ratio to drop to 1:1. The RPM that the ratio reaches 1:1 varies depending on other factors in and out of the torque converter such as impeller exit angle, stator design, impeller to turbine clearance, input torque (engine), etc.the stock torque converter you took out of your car has a STR of 1.9-1.94. In our tests we have never seen an STR over 2.55. Examine your car's engine specifications (get the cars engine dyno tested or at leash have a good idea of the engines power curve,) or take it to a shop with a chassis dynamometer to have it measured. Note the engine's peak torque and the rpm that it occurs at youll want the stall speed to be just a bit lower on a street car to increase drive-ability and just a bit higher than peak torque on a race application to maximize useful power. remember your converter slips a good deal more and produces a good deal more heat in the trans fluid below the stall speed, so you don,t want the engine spending a great deal of time below the stall speed in its intended application. Add about 15 percent to your engine's peak torque figure if you used a chassis dyno instead of factory horsepower ratings, and your looking at a race application,. The engine, transmission and wheel require a certain amount of horsepower to turn, meaning that such "wheel horsepower" will register lower than the flywheel horsepower you need. 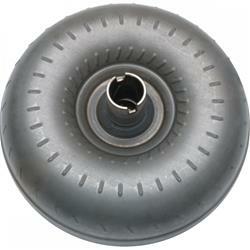 Order a torque converter that matches your engine's peak torque output and peak torque rpm as closely as possible. If you can't find one that matches it precisely, error on the side of caution by choosing one with a slightly lower stall or higher torque rating . You'll lose a little performance with a stall that's too low, but you'll lose performance, fuel economy and drive-ability with one that's too high. ,in my 383 sbc corvette and a 3200 rpm stall speed converter the difference in performance was amazingly better. swap too a 3.73:1 rear gear and you've noticeably further enhanced that seat of the pants and slam in the back acceleration. 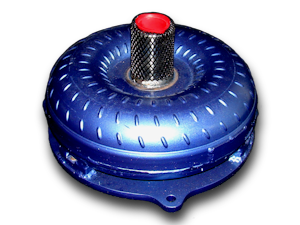 Torque converter stall is a commonly used term and is commonly misunderstood. Stall is the speed at which the converter will hold the engine speed and not allow further gain (i.e., the engine "stalls"). The key word here is engine. The speed at which stall occurs with a given converter is a function of engine peak torque. It is clear that the stall speed on a given converter will not be the same coupled to a tame small block engine when compared to a big block with all of the muscle features added. When comparing stall speeds it is important to account for the engine that drives it. True converter stall can best be determined when a Transbrake is used. Testing for stall value by locking the wheel brakes generally does not produce a true stall value because the engine power can often cause wheel turn by overpowering the brakes. Stall speed determined by this method should be identified as such when discussing stall speed determination. Flash stall is determined by launching at full throttle and observing the peak speed attained at launch. Selection of the right stall speed for your vehicle should be matched to the engine peak torque, engine torque curve shape and vehicle weight. In general, the stall speed selected for your converter would be 500 to 700 rpm below the peak torque. This speed allows the margin for application of the torque reserve on takeoff. When selecting stall speed without having prior experience to go by, it is better to conservatively estimate the engine torque than it is to over estimate it. If you over estimate the torque output you will have a converter with a stall speed too low, making your car slow off the line and have slow ET. A properly selected stall speed will give you better launch and better ET. You can see why it is important to consult with professionals prior to making a stall speed selection. Within the converter, stall speed is balanced off against inefficiency after launch. Getting desired stall at the expense of performance after launch is just as costly as improper stall speed to begin. The optimum converter has careful selection and design of changes to the impeller, turbine and stator. "HOW CAN I DETERMINE THE STALL SPEED OF MY CONVERTER? as an example on this 500hp 350sbc above,designed for the drag strip, a 4500 stall would be almost ideal. The more torque your engine produces ,the higher rpm a torque converter will stall at. A converter will stall higher on a hot 383 or 427 sbc than on a stock 350 despite what it's rated stall speed is. 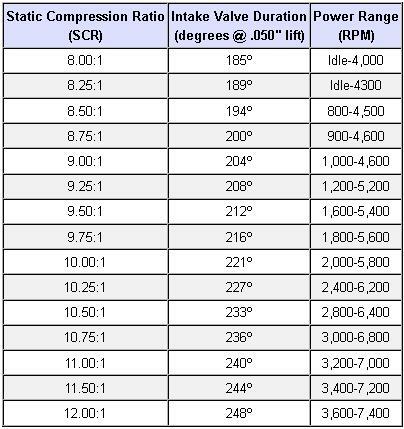 The better manufacturers have a chart telling what speed a certain converter will stall at with what torque level but even then its just an educated guess, as each converter will be a bit different from its clones. and youll want the engine to cruse at 70 mph in the lower end of the engines effective torque curve, If you take the time and effort to do all the math and accurately match the rear differential gear ratio, transmission gearing and tire diameter youll eventually find a clear consistent advantage to use of a transmission with an over drive top gear ratio of near .70-.75 in most cars and a rear gear ratio in the 3.73:1-4.11:1 range for performance cars. its hard to over stress the importance of matching the cars rear gear ratio and stall speed on your converter, if youve got an automatic transmission ,to your engines peak torque curve and power band. Its just as important to realize you tend to get what you pay for in stall converters and the less expensive converters tend to fail far more frequently, making them a bad value, especially if they trash your transmission during their failure process. 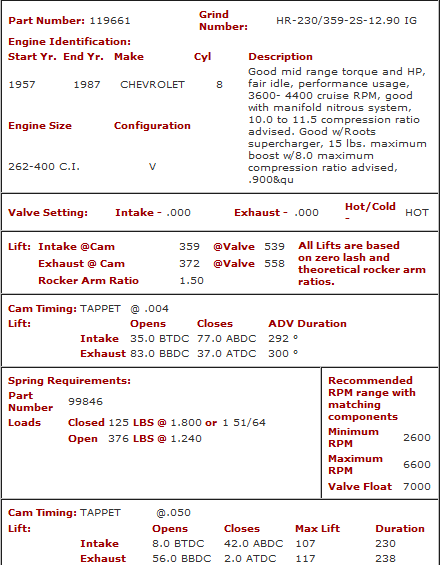 Here is a list that I found posted for the trucks that use the 4L80E forChevy. 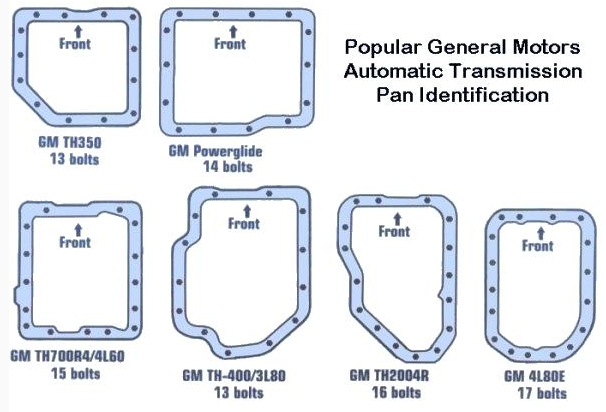 GM uses the same type 4-digit ID method of identifying FWD torque converters as with the RWD units, however the digits have different meanings. 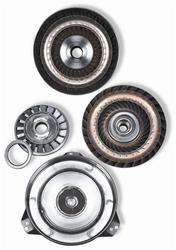 All 125-C, 440-T4, 4T60, and 4T60-E transmissions use the same style torque converter, and they are interchangeable before 1996. 1996-up converters are built to be compatible with GM's PWM TCC apply strategy which means that you can use the newer converter on the older trans, but not the older converter on the newer trans. Pertaining to the TCC Clutch material: starting in 1996, GM implemented a new TCC apply strategy. The 1996-97 trannys (exc 3T40), used a soft-apply (PWM) TCC strategy which was designed to soften the TCC apply so the "customer" would not feel it come on. This means that the PCM is actually making the TCC slip during apply. 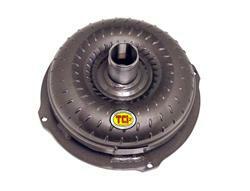 Only Carbon clutch torque converters should be used in 1996-97 trannys. You can use the carbon clutch TC's in earlier trannys that did not have PWM technology, however the lockup feel will not be the same. However, I have heard that these carbon clutches rarely burn-up or go bad. I have personally used the carbon filled clutch TC's on earlier trannys and the only experience I have witnessed with them is they apply firmer. Starting in 1998, GM revised the lock-up strategy once again only this time the TCC may never completely lock up and may always slip about 20-60 rpm, depending on the vehicle. 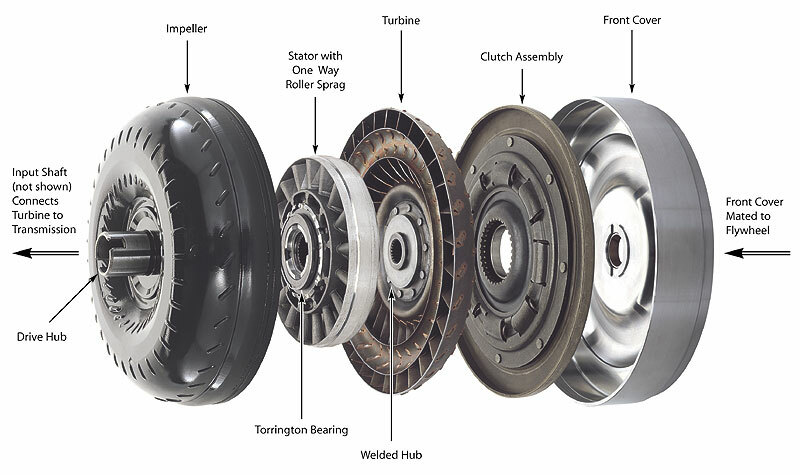 This means that even the carbon clutch units would not work well for these applications thus GM started using woven-graphite TC clutch material. 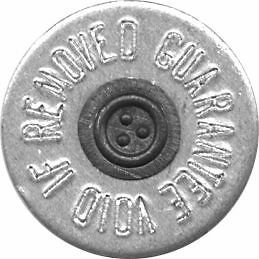 I have heard that the woven graphite TC's should not be used in any earlier transmissions because the lockup will not work correctly. This information should be used as a reference guide only. What do I need to know about torque converters before ordering one? Retarded cam timing t fit their transmission s input shaft. However, since performance converters are built to much closer tolerances than OEM units, the hub-to-input shaft fit is tighter. This often leads people to think the new converter s hub is too small because they are used to slipping the stock converter on without any resistance. 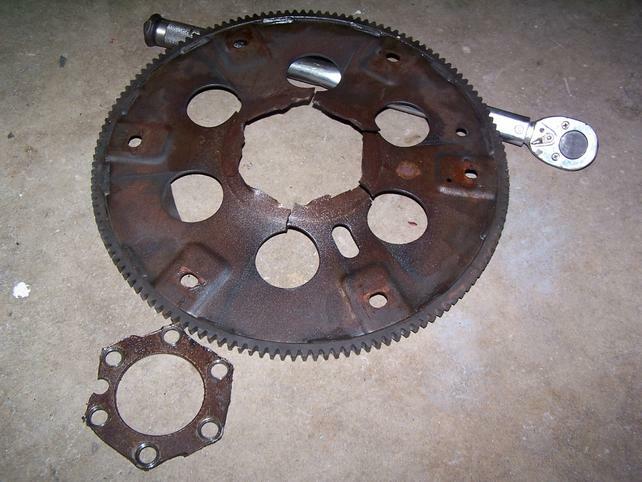 Heat is the biggest enemy of a torque converter and transmission. 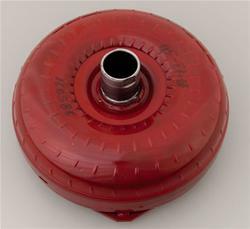 A higher stall torque converter imposes greater loads on the transmission and creates more heat. Thus, a high capacity transmission cooler designed to protect your converter and transmission from heat damage is a wise investment. Finally, nothing beats professional advice when choosing a torque converter. A phone call to one of the converter manufacturers or to experts like Summit Racing Equipment will help you pick the right converter for your vehicle. about what transmissions, gearing and converters are being used by the guys who have cars running in the 10s- and low 11 second range. as to what they found works and who stands behind the warranty vs who sells junk! one of the very common misconceptions I hear repeated endlessly is that a higher stall speed converter will make the car used on the street a P.I.T.A. to drive and that if you select something like a 2800rpm stall converter the car won,t move until, the engine rpms hit near that rated stall speed. I thought that this would be of interest to some. 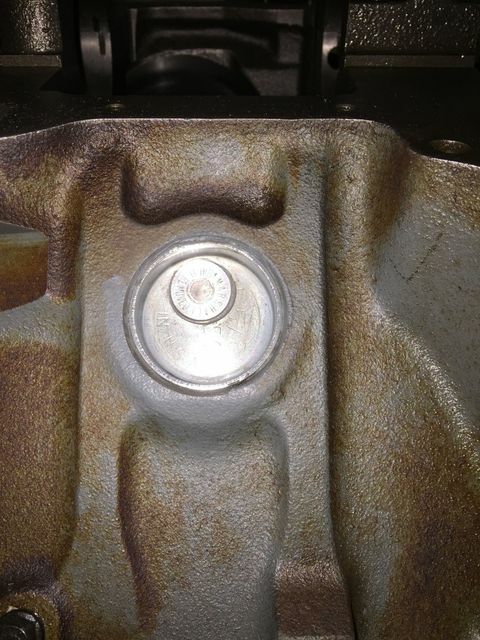 I have a mild 383 sbc with GMPP Bowtie Vortech 185cc heads (25534421) and a GMPP Hotcam in a 1972 Chevelle (TH350). Static compression is calculated at 9.6:1. Cranking compression is 185 psi. I wish that I could take the converter off the comparison but it's too late. cost incurred in buying cheaper parts,in this hobby! good quality parts tend to cost more, so expect to pay a fair price, remember the sweetness of low price tends to be forgotten long before the bitterness of living with low quality, that remains forever! IN almost 100% of engine builds, your FAR better off purchasing and correctly installing a few high quality components, than you would be, after spending twice too three times as much money on, three to four times as many low quality parts randomly selected mostly because they were on sale! GREAT DEALS!...RARELY ARE, looking back later! Original article from Summit Racing's website. Torque converters are way up there on the list of Dark and Mysterious Things along with sorcery, corporate accounting practices, and figuring out dial-ins. Because there are so many factors involved in choosing the right converter, many people end up getting the wrong one for their application, resulting in poor vehicle performance and broken transmissions. But it doesnâ€™t have to be this way. You too can learn how to choose the right torque converter, and this little primer will help you get started. Weâ€™re going to highlight the basics on things like stall speed, matching a converter to cam size and rear axle ratio, special considerations for nitrous and blowers, and more. Without going into a bookful of theory, a torque converter is a hydraulic coupler between the engine and the transmission. It changes mechanical torque (engine torque) into hydraulic pressure before sending it back to the transmission. The converter also multiplies the torque at low speed or during periods of high engine load. 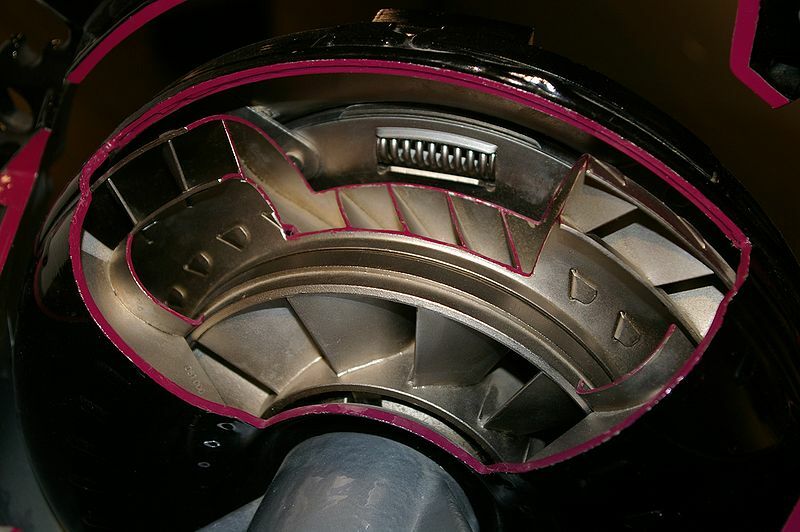 Inside a converter are an impeller, a stator, and a turbine, all surrounded by transmission fluid. The impeller rotates at engine crank speed, acting as a fluid pump. The turbine is the output member hooked to the transmission input shaft. The stator sits between the two, acting as a torque multiplier when impeller speed exceeds turbine speed. When the converter reaches its stall or lockup speed, the stator stops multiplying torque and the converter essentially acts as a fluid coupling. When the vehicle is coasting (no load), the converter directs torque back towards the engine, acting as a brake. What is Stall Speed, Anyway? The one thing people misunderstand the most about torque converters is stall speed. Many think that if they have a converter rated at 2,500 rpm, the car will rev up to that rpm and then take off. Thatâ€™s not how it works. Stall speed is a function of engine rpmâ€”the more torque your engine makes, the higher the rpm the converter will stall, or lock up at, and transfer that torque to the transmission. There are two types of stall speedâ€”foot brake stall and flash stall. Foot brake stall (also called true stall) is the maximum rpm that can be achieved with the transmission in gear, the brakes locked, and the engine at full throttle. The rpm reached before the vehicle moves is the true stall speed of the converter. The problem with foot brake stall is that you will end up overpowering the brakes and suspension before you reach the converterâ€™s stall speed. The only way to really measure true stall is by using a trans-brake. This will keep the vehicle from moving, allowing the converter to absorb 100 percent of the engineâ€™s torque. Race classes that do not allow trans-brakes are often called foot-brake classes. In this type of racing, the rpm obtained when the brakes are applied and the vehicle is not moving is considered to be foot brake stall. When the brakes are released, the engine goes to full throttle and â€œflashesâ€ the converter. That leads us to flash stall. It is the maximum engine rpm reached when you launch a vehicle at full throttle from a dead stop with no brakes applied. Flash stall is always lower than true stall because there is less load on the converter. It is dependent on many factors including vehicle weight, rear-axle gear ratios, and tire height. Anything that decreases the load on a converter (numerically higher gears, less engine torque, low vehicle weight) will cause the flash stall speed to be lower. Conversely, increasing torque, going to a numerically lower gear, or building a heavy car will increase flash stall speed. Another factor that gets confusing is converter slip. Slip is basically a measure of converter efficiency. 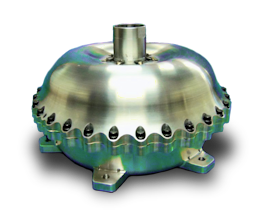 Due to the difference in rotating speeds between the impeller and the turbine, there is usually a five to 10 percent efficiency loss at cruising speeds for non-lockup converters. Because a converter gradually slips, or creeps up, to full stall/lockup rpm, the higher the stall speed, the more slippage you get. On a street-driven vehicle, that can lead to poor idle and low end performance, worse gas mileage, and most importantly, greater heat buildupâ€”the number one killer of converters and transmissions. If you do run a high stall converter, a good transmission cooler is a must. What Kind of Engine Are You Building? 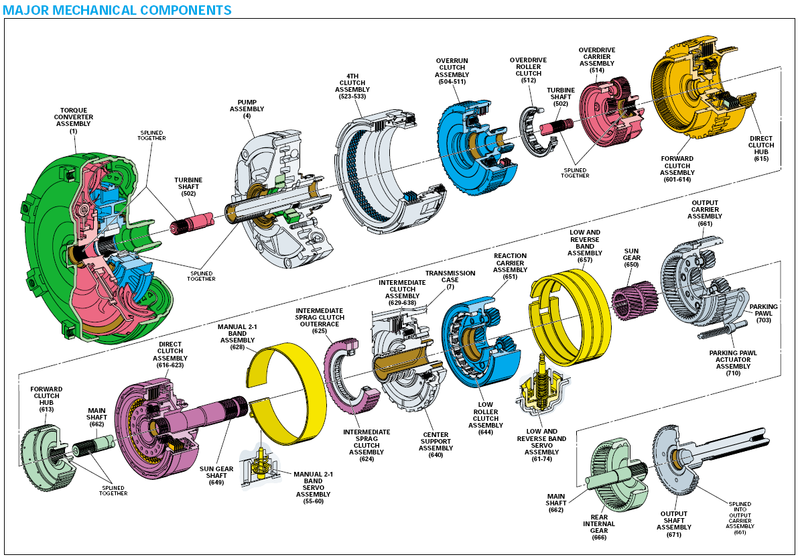 Before you even crack open a torque converter catalog, you need to be realistic about the type of engine you are building. You need to match low and mid-range engine torque to the converterâ€™s stall speed. For example, if you are building a street small block that makes most of its torque around 2,500 to 3,000 rpm, donâ€™t get a converter that stalls at 4,000. Not only will the car be hard to drive, the converter will constantly slip and will eventually be destroyed due to overheating. If you build a big block that makes its torque at 4,500 rpm or so, donâ€™t expect it to be much fun on the street because of the high stall converter and big rear axle gear required to get the converter to lock up. Camshaft selection is also critical to torque converter selection. 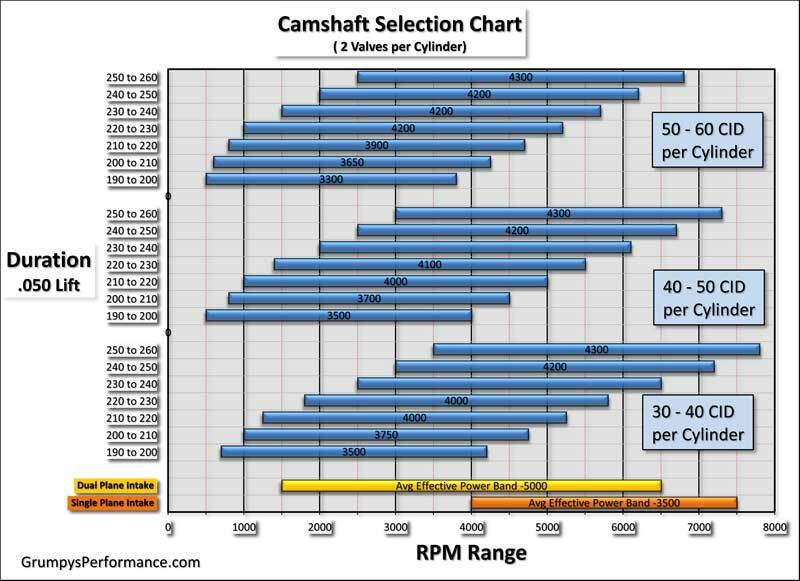 On the street, many people will choose a cam that will put an engineâ€™s rpm range 1,500 to 2,000 rpm higher than stock. Not only does that reduce bottom end torque, but a higher stall converter will be required to match the new torque peak. Many people will get the recommended converter, but neglect to upgrade the rear axle gear to compliment the higher stall speed (more on gear ratios and tire sizes in a minute). Say you built a small block V8 with a 235 degree (at .050)/.488 inch lift cam and added a converter rated at 3,000 to 3,500 rpm. To make the combination work properly with a minimum of converter slippage, you will need a 4.10 or higher rear axle gear with 26 to 27 inch tall tires. 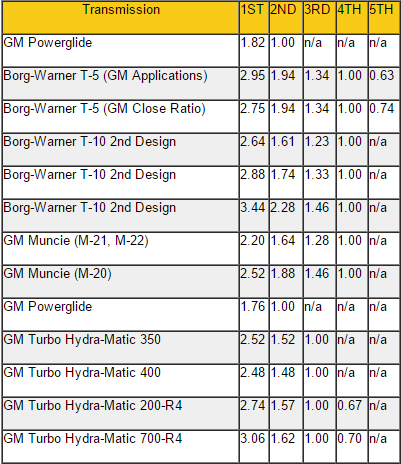 Illustration One shows you approximate stall speeds based on engine type, cam duration, and rear axle gear ratio. Nitrous or supercharging also affect converter selection. An engine with one of these power adders produces more torque than it would if it was normally aspirated. That means a nitrous or blown engine needs a converter with a lower stall speed range. Otherwise, the converter will stall too high, causing it to slip and eventually self-destruct due to the extra heat generated. Rear axle gear ratio and tire diameter are very important to proper converter selection. You need to have enough of a final cruise rpm (rpm generated based on tire diameter and rear axle gear ratio) to allow the converter to function at full lockup at cruising speeds. If you donâ€™t, the converter will constantly slip. Illustration Two shows you the rpm generated at 60 miles per hour with various gear ratios and tire diameters. This will help you determine where your converter should stall. You can see how close your vehicleâ€™s actual cruise rpm is to the chart by reading the tach at a steady 60 mph, find your gear ratio and tire diameter in the chart, then compare your rpm reading to the chartâ€™s suggested rpm. Torque converter size can also be confusing. 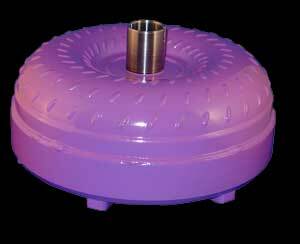 Converters can range from 11 and 12 inches in diameter all the way down to 7 inches. Basically, the smaller the converter, the less fluid has to be pumped through it. 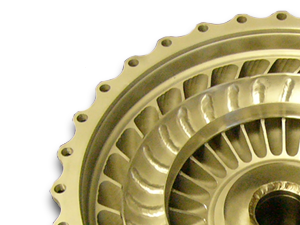 Less fluid means less drag on the converter internals, which allows it to stall at higher speeds. 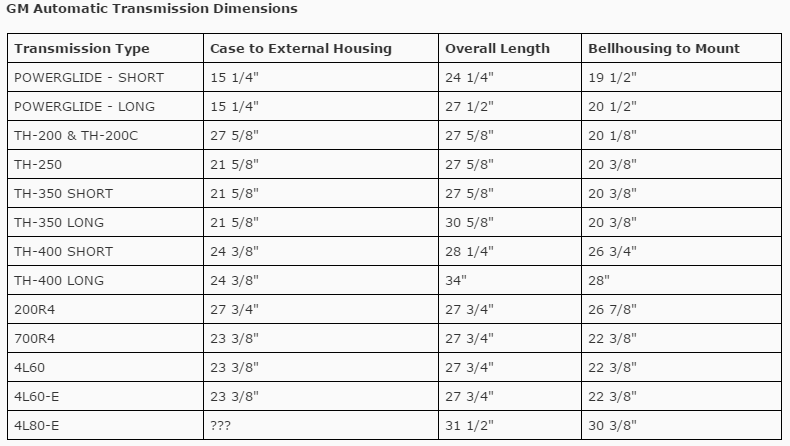 Thatâ€™s why you see 8, 9, and 10 inch converters listed for racing applications. In general, you want to avoid small converters on a typical street car due to the much higher stall speeds (usually 3,000 rpm and up). If you are adding a lot of nitrous (over 200 horsepower), running high blower pressure (over 12 psi), or use a trans-brake, you will need a converter built to handle the extra stress. The extra torque generated can cause a converter to â€œballoonâ€, or expand in diameter. 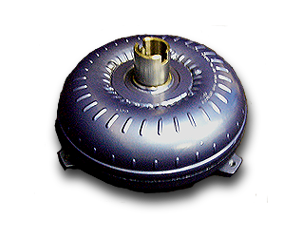 Look for a converter with a high quality stator assembly and an anti-ballooning plate to keep it from expanding. A common complaint about aftermarket torque converters is fitment. Often, a new converter will not fit the transmissionâ€™s input shaft because it is built to much closer tolerances than OEM converters, so the hub-to-input shaft fit is tighter. Just because the new converter will not slip onto the input shaft doesnâ€™t mean the converter is defectiveâ€”just use a little extra effort. A good way to check if a new converter will fit properly is to compare it to the stock converter you are taking out. Illustration Three shows the three critical dimensions: overall length (from engine mounting face to end of hub), hub slot depth, and hub slot inside diameter. Before you remove the old converter, check the dimension from the bellhousing to the front with the stock converter in place. This will help you position the new converter properly. A higher stall converter will place extra stress where it mates to the engine, so make sure you use quality converter bolts (like those made by ARP) and an SFI approved flexplate. 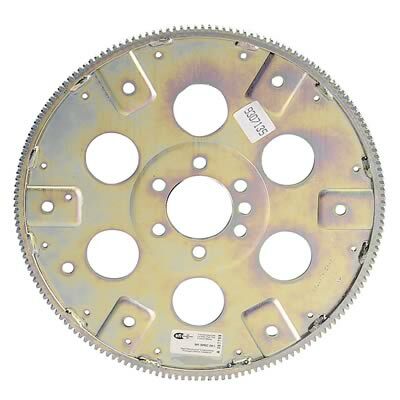 SFI approved flexplates for Chevys are usually double drilled for small and large bolt patterns, eliminating the need to guess which bolt pattern you have. Aftermarket torque converters are neutral balanced, designed for internally balanced engines. Most externally balanced engines have the balance weight on the flexplate, so this is no big deal. But on externally balanced Chryslersâ€”340 and 360 small block and 440 big blockâ€”the factory put the balance weight on the torque converter. If you have one of these engines, make sure to get the appropriate flexplate counter weighted to match the engine balance. Most SFI approved Chrysler flexplates have this counterweight. Donâ€™t consider this to be the end-all and be-all on torque converters. The best way to get the perfect converter for your application is to talk with the tech guys at Summit or even better, directly with the companies that build the converters. Hopefully, this guide will help you ask your converter builder the right questionsâ€”and understand his answers. when you go to select a converter stall speed keep in mind that You can have a lot of mismatched parts, and your engine and drive train will still seem like it has few or no major performance issues, you can forget to use options like deep baffled oil pans, transmission coolers and larger radiators, windage trays etc, the engine may run fine for a while, but in the long run its going to cost you in both performance and engine durability, issues and increased parts failure rates. even when component parts are significantly restricting power compared to what it could be producing, but if all the parts are better matched to the engines power band and the cars gearing and intended operational range, you'll get an even better bang for the buck. Build the engine for the 90% of the time your using the car and your driving style. 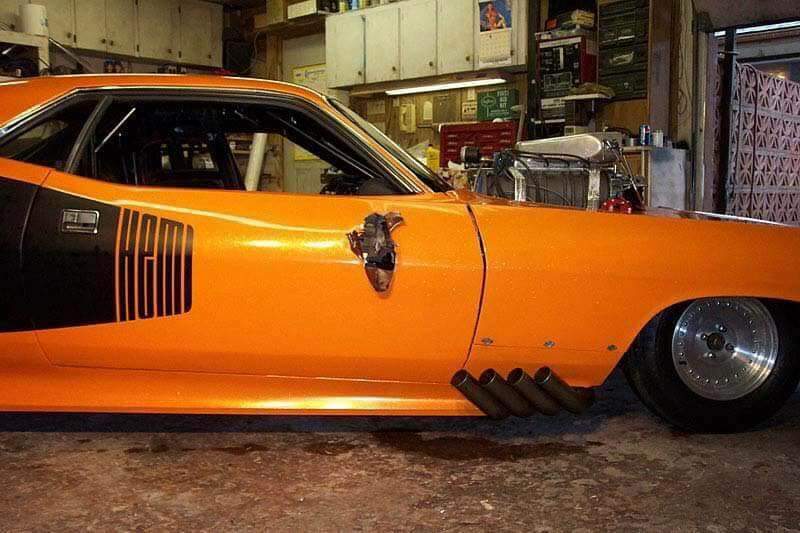 A car that's normally driven on the street and highway doesn't need or work well with parts that belong on the race track, both durability and mileage will suffer and so will your average performance, its almost always a better idea to work toward increased durability, that for the last couple potential peak horse power, if getting them reduces the engines durability. stop and think thru your options and get advice from both several different cam and several different torque converter manufacturers , both will try to help if asked because they want you to be happy with the results. as a general rule stock converter stall speeds rarely exceed about 2300rpm and rear gear ratios rarely are higher numerically than about 3.33:1 so once you make changes the stock converter stall will rarely match or work correctly with longer duration cams required for increasing upper rpm power bands that those larger cams will require. any converter with a stall speed above about 2600rpm will require a aux trans cooler if you regularly beat the car, demanding higher rpm performance and the higher the stall the more heat is produced in most cases. HOW DO YOU DETERMINE YOUR CURRENT CONVERTER STALL SPEED? measure very carefully youll need to mount the transmission cooler in a location that allows clearance for both the cooler and its supply lines and in a location with easy access to outside air flow so the heated air can rapidly be replaced with cooler outside air, for effective heat reduction to the fluid to effectively take place. ID suggest no smaller than AN#8 line (1/2") size and a 24000 lb weight rated cooler if you have the room to mount one on a serious race application, with a high stall speed torque converter. 1. Position the car on a deserted street or parking lot so that as it moves no one will be in the way. 2. Raise the rpm to a fast idle in neutral to get maximum engine vacuum for the power brakes and press the brake pedal heavily and hold to get the maximum holding power. 3. Come off the throttle and shift into drive or manual low. 4. Still holding full brake pedal, go to WOT in less than 1/2 second and hold for a second or two noting the maximum rpm attained; and then return to idle. Note: The car may move a few feet and then abruptly stop when returning to idle - this won't invalidate the results. Important: Don't hold WOT for more than 2 seconds as the trans fluid will heat rapidly in the stalled condition. To perform this test install a tachometer, chock all four wheels, and set the parking brake. Make sure the tachometer is viewable from the drivers seat. Place your foot firmly on the brake pedal and place the transmissions shift selector in Drive. 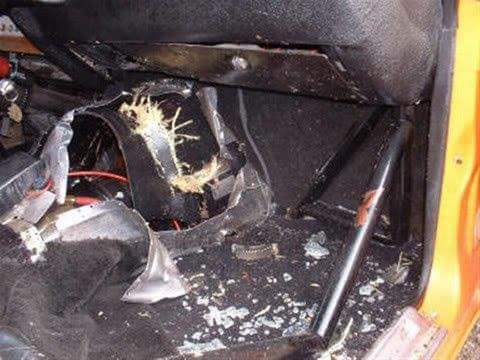 While holding the brake pedal press and hold the throttle pedal to the floor for 2 or 3 seconds. Always check with the manufacturers recommendations because this test places stress on the transmission. Never exceed 5 seconds. Compare the reading (stall speed) on the tachometer to the manufacturers specifications. During a stall test the torque converters impeller is spinning at maximum speed while the turbine is being held stationary. Since everything from the turbine back is being held stationary a vibration like an out of balance drive shaft would not appear during a stall test. If this reading is below specifications the torque converters stator one way clutch is spinning freely or there is a restriction in the exhaust system. If the reading is above specifications the transmissions clutches and bands are slipping. Take the following precautions Check with your car or transmission manufacturer to make sure it's safe to run the test. 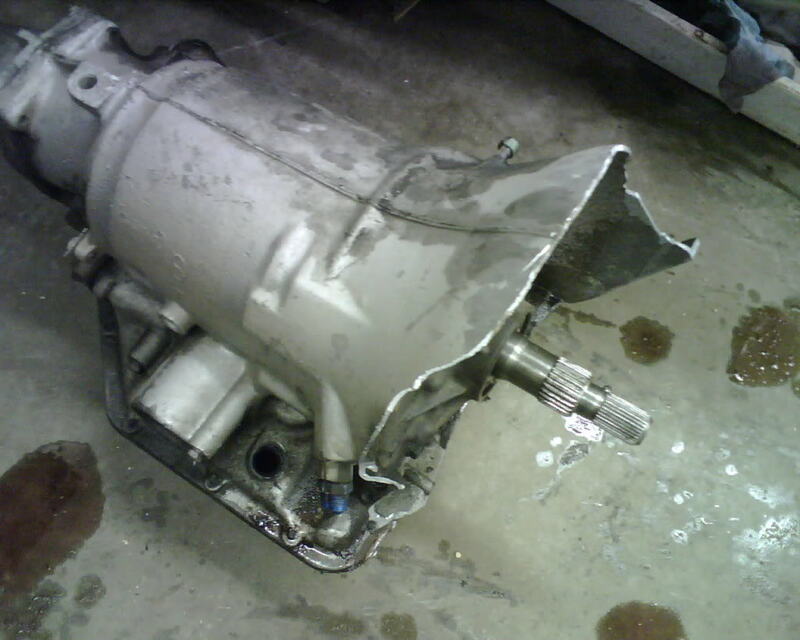 Most newer transmissions, as well as some older ones, can actually be ruined by a stall-speed test. 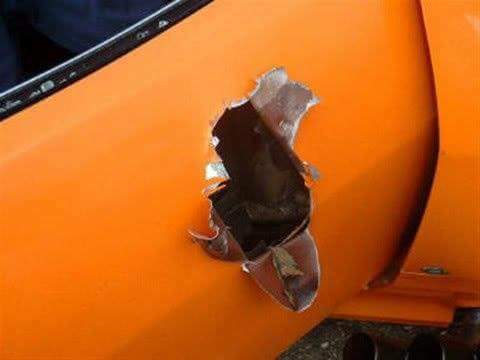 Don't run a stall-speed test for more than five seconds at a time. Don't run this test on vehicles that have traction control or anti-lock brake systems. On some electronically controlled transmissions, a stall-speed test will set off your check engine light. Prepare your car Before testing your torque converter, make sure all your fluids are in good condition. Also, chock your wheels and set the parking brake. If your car doesn't have a tachometer, install one that can be seen from the driver's seat [source: ASE Test Prep]. Start your engine Press the brake pedal all the way to the floor and start your engine. Shift your transmission into drive. Don't let go of the brake. Put the pedal to the metal While pressing on the brake pedal, press the accelerator to the floor for two to three seconds. 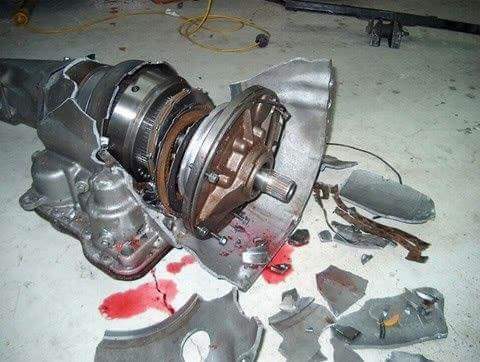 Don't exceed five seconds, or you risk blowing out the transmission. The RPM the engine maxes out at is the stall speed. Runout - runout should be less than 0,25 mm (0,010 inch). not be internally out of balance. Overall balance should be held within 10 grams. Fit of pilot bushing - 0,10 mm-0,20 mm (0,004 inch - 0,008 inch) typical. Your oldest posts from 2008- 2010 have been most informative to me last few weeks Grumpy reading on my own. The torque capacity of the 4L60E is a bit optimistic. Rated 670 Ft/lbs. I would rate it at 350-375 ft/lbs stock. The weakest link is the 3-4 clutch pack layout stock. The rear reaction gearset is weak. The factory blueprint clearances are terrible. Loose as a Goose. Blueprinted & built right with NOS MADE IN USA 4L65E Front & Rear 5-pinion 4L65E gplanet gearsets, special calibration valvebidy parts, you can push to 600 Ft/lbs Continous. Last around 10,000 -50,000 miles. The 4L80 E is rated 880 ft/lbs. A modern BBC Race engine exceedss that too. Twin Turbo or a 500 Hp shot of Nitrous gives pver 2,000 Ft/lbs Flywheel Torque instant. 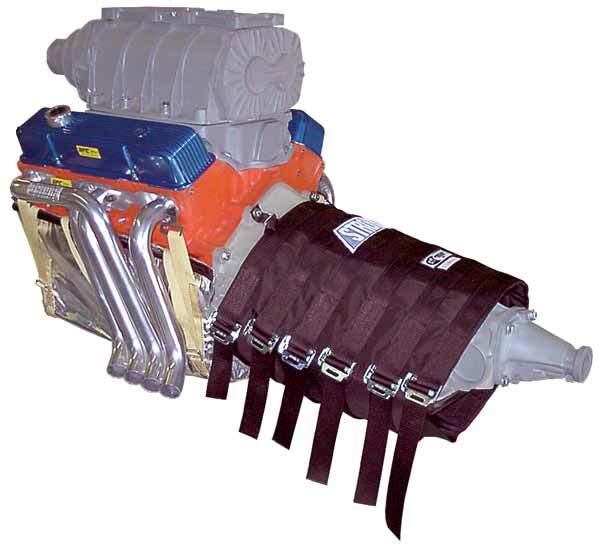 A Vortech YSi blower at 28-40 psi gives over 2,000 ft/lbs instant in a race engine too. So are modern overdrives all superior ? Turbo 400. Powerglide. 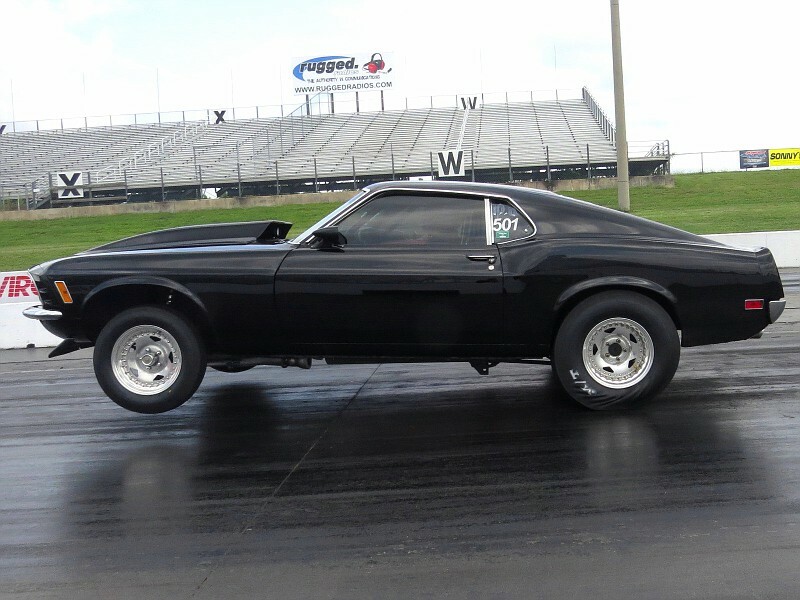 727 Torqueflite, C6 Ford still used in drag racing. They hold up to heavy abuse. No one can possibly keep up with all the newer performance parts available. that makes a bit more than 800 ft lbs and needs a 3000 rpm stall speed?? yeah! I know what I'd likely use but I'm well aware that technology is always changing and I'm open to suggestions. If youve been involved with this hobby for more than a few years you rapidly come to realize that what was the "hot ticket" 3 or four years ago may no longer be close to the best choice currently , nor will todays tech remain the best potential choice in a few years time. Order this item and get free delivery and handling on your entire order! Oversize fees also waived on this item. Valid on orders shipped in the contiguous United States. In-Store Pickup: Choose In-store pick-up (OH, GA, NV) on our web site. Chevrolet Performance SuperMatic torque converters are tailored for performance. Designed for Chevrolet Performance crate engines and transmissions, these torque converters are built to match the power outputs of their engines and to help ensure optimal performance of your powertrain system. Your project is different than the next guys but Chevrolet Performance SuperMatic torque converters bring together your application for durable factory-engineered performance that will have you cruising in no time! Order this item and get free delivery and handling on your entire order! Offer excludes truck freight fees. Valid on orders shipped in the contiguous United States. A higher-than-stock stall speed as delivered by these B&M Holeshot converters will provide several advantages and benefits to vehicles with modified engines. Many modifications, particularly big cams, tend to reduce low-end power and torque. These high-stall converters allow the engine to launch the car at higher rpm, where more torque is available. They're a very good choice for the typical street machine that is looking for better launch capability and more strength. 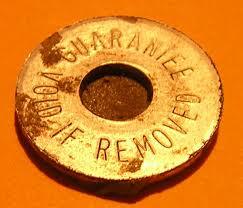 Notes: Contains special heavy-duty sprag. The most important factor in performance driving is how your car leaves the starting line. For this reason, all Hughes Performance Pro-Street 30 converters are brazed to increase strength and have a full needle bearing design to ensure reliability. Excellent for weekend racing and high performance street use, they also have a strengthened sprag for durability. $25.00 Certificate that can be used on future purchases. Summit Bucks are redeemable via phone, mail, online or by presenting them at a retail location. Notes: Includes billet style cover. These TCI StreetFighter converters are completely remanufactured with furnace-brazed fins, needle bearings, and a flame-hardened hub. StreetFighter converters will give you about a 3,000 to 3,500 rpm stall speed. They're recommended for use on high-compression street/strip engines and higher performance cars and are used on some of the fastest street machines the world over. Plus, some applications are available with an anti-ballooning plate for use on vehicles equipped with nitrous oxide. Gain as much as 3000 rpm more stall for harder launches! Car or Truck that is intended primarily for street duty. Unlike other converter companies that sell an off the shelf, one size fits all street performance converter, NCRC Street Performance Converters are 100% custom built for your application so that we can carefully match the stall speed to what your vehicle needs. Available 9.5" Diameter Turbo Spline for GM TH350/TH400 or Glide with Turbo Input Shaft. All NCRC Street Performance Converters are covered by the famous NCRC "If you can break it, we’ll fix it" 1 year warranty. Lead Time after order placement is typically 1 week. Another first in Racing Torque Converter Technology from Neal Chance. The new, All Billet Aluminum Bolt Together Converter is 6 lbs lighter than our Steel/Aluminum Bolt Together for dramatic weight savings right at the end of your crankshaft for maximum accelleration gain. Not only is it lighter, the Full Billet Converter also offers State of the Art 5 Axis CNC Precision Machined Pump Fins and Stators for the Ultimate in Efficiency and Power Transfer. The latest innovation from Neal Chance Racing Converters is the Full Billet Internal Lock Up Racing Converter. This unique new converter was a top secret joint project between NCRC and Rossler Racing Transmissions, but the cat is out of the bag now! During 2014, this converter captured ALL the Turbo World Records and ALL the Pro Nitrous Records in PDRA!!! It works either with Rossler’s TH400 Based Transmission such as the 210 Series 3 speed, 2 speed TurboGlide or Bruno Drive. 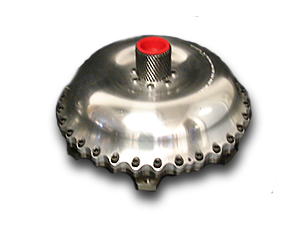 The Lockup Converter offers far more durability than a “Dry” clutch, with the ability to last an entire season in a 3.70 Nitrous car with no wear! thank you for taking the time and effort to post all that info! than most of us can easily afford! I have not ever used and raced with a 4L80 E trans Grumpy. Its one part you myst choose with your own expertise. Budget limits also here present. I really like the COAN RACE Torque converters. Little guy can still prevail and win with them. Main problem with high horse l series converters is the lock up there is no cheap way out with those numbers I payed around 500 for my 700r4 converter with a carbon lock up disc stage 3 which is only rated for 500hp 2600 rpm. I have liked it so far use the lockup to keep milage in highway driving. Ordered from revmax good ratings eith the deisel guys they were a good bang for the buck. There is a local place to here also called buffomatic allot of the locsl drag guys like.